The main reason for a coolant to change its colour to brown during vehicle operation is rust and deposits formed on the cooling system elements due to using water as operational fluid or applying low-quality antifreeze. After being replaced, the coolant starts to clean the cooling system under the influence of special additives (anticorrosive, stabilizing, washing etc.) which results in the antifreeze discoloration. Change of the antifreeze colour to straw yellow or slight colour fading indicates the end of the service lifetime of the colorant or engine overheating. The colorant has a certain thermal stability and changes its colour depending on the operational time at a certain temperature which characterizes the engine combustion intensity. The time needed for discoloration to take place depends on the quantity of various deposits and rust in the cooling jacket and the system condition in general. The faster the fluid colour is changing, the larger quantity of various deposits are present in the engine. 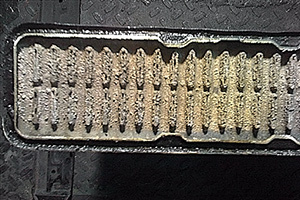 Preliminary flushing of the whole cooling system before changing the coolant allows to avoid such problems.